It was a wonderful 70 degrees here today and I decided to spend it in my fabulous wax print dress. 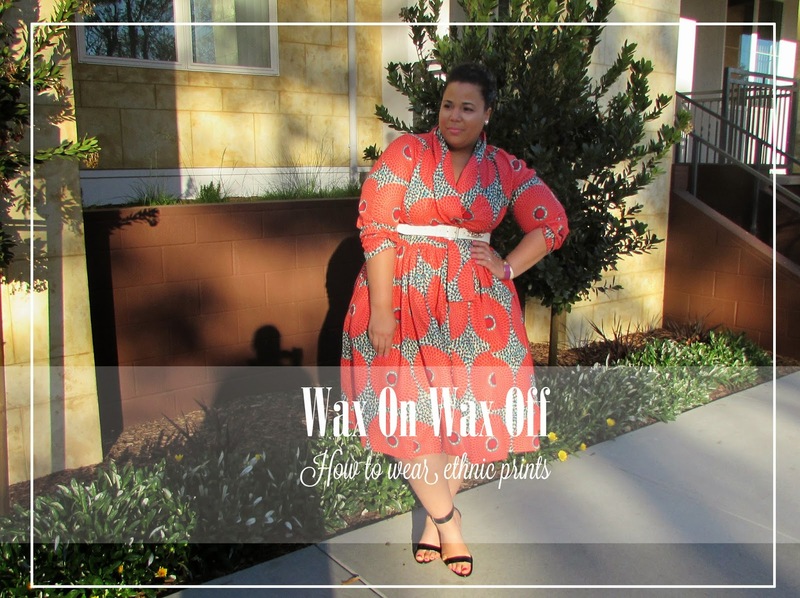 I wanted to give a quick how to guide on wearing ethnic prints, because I know they can be a little intimidating at first. I know I was scared for a long time until I tried it and absolutely loved it. 1. There's nothing to it, but to do it - The major battle with trying anything new is just trying it. If you always say you can't wear something then you can't...but if you say maybe then that opens up possibilities. 2. Don't go all in at first - Try a top or skirt then add in a solid piece. Then you can build your way up in to a full outfit. 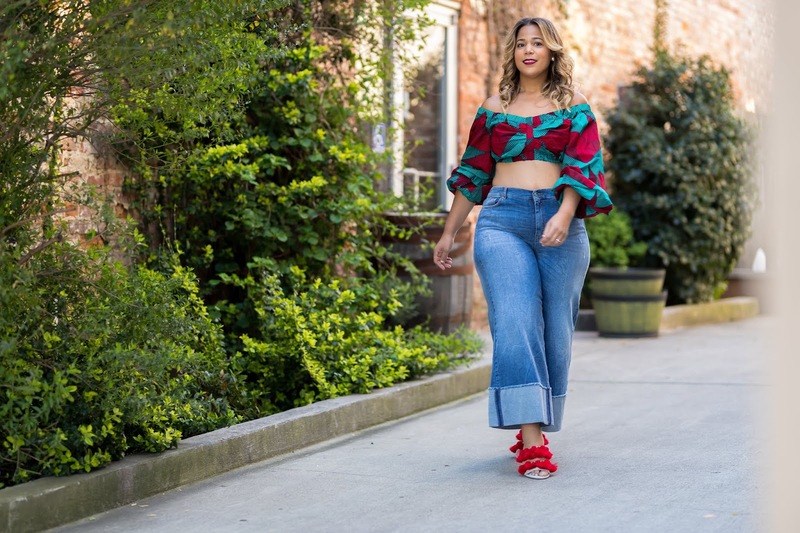 Any full body outfit in a print can be overwhelming, so sometimes it's easy to process if you break it up first. 3. Choose your prints wisely - Just like with any print there are bad color combinations and prints. The designer of this dress and the Demestiks line does a great job of picking out fabulous prints for his garments. 4. Familiarize your look with accessories - We as people love things that are familiar. Adding in your favorite accessories can help you make the print feel more natural. I added in my own sunnies which have a very Jackie O. Americana feel. 5. If you are intimidated go a little less "ethnic" when choosing prints - I hope I am not offending anyone when I say this, but there are some prints that scream the region that they are from and there are some print that give you a hint of the region. 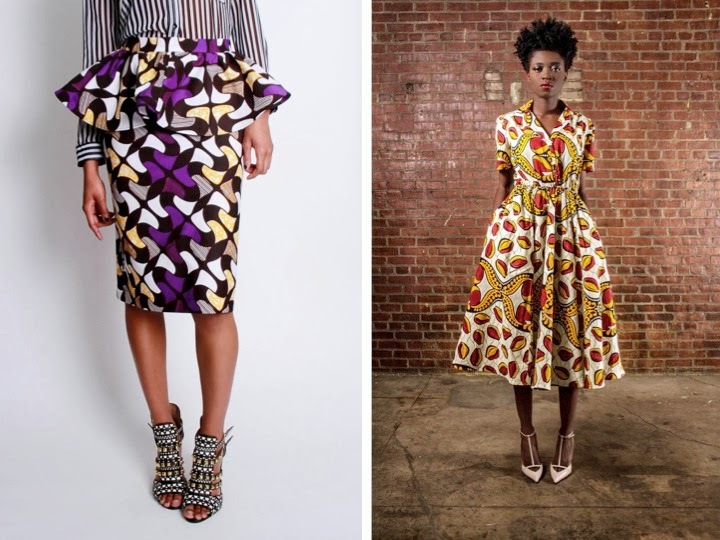 For example, the print on the left, to me, feels more inspired by the region as opposed to the print on the right screams Africa to me. Style Notes: The dress that I am wearing is a wrap, so note that you will need to provide your own belt so close the dress. 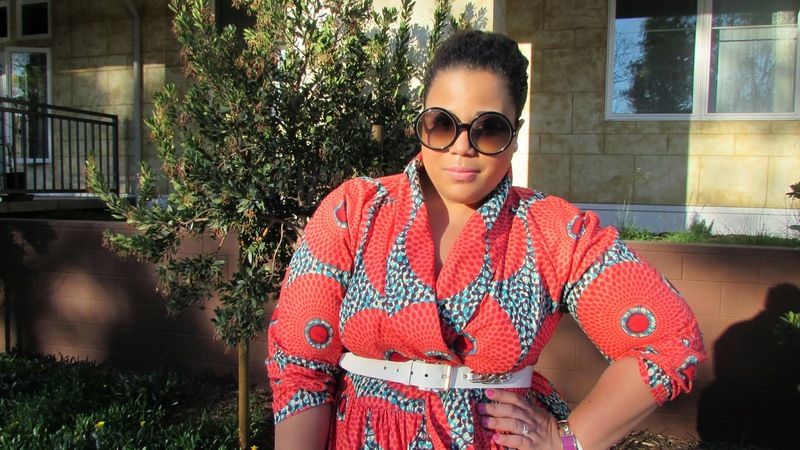 I've worn two other pieces from Demestiks, you can find the posts here and here. Also, the shoes I am wearing are probably going to be my new "go to" for the summer. They are a small wedge sandal from Calvin Klein. They are so comfortable and there is just enough heel to add height, but not enough to be uncomfortable. I wish they were offered somewhere online. I bought them in-store at Nordstrom Rack. This is definitely a great option for those looking for a cute yet comfortable shoe with some lift. Your dress has such an inviting design even down to the colors. It compliments you well. Very cute! OK. I'm going to be an usher/hostess at a wedding in April and I think I just found the dress I want. The one YOU ARE WEARING! This is so your style and would look amazing on your skin color. You know you are welcome to come!!! I'm just wondering how you are going to muster up the courage to leave that little one LOL. I'm loving the print of your dress so much! I've always loved ethnic prints but only used them in headscarves and wraps. 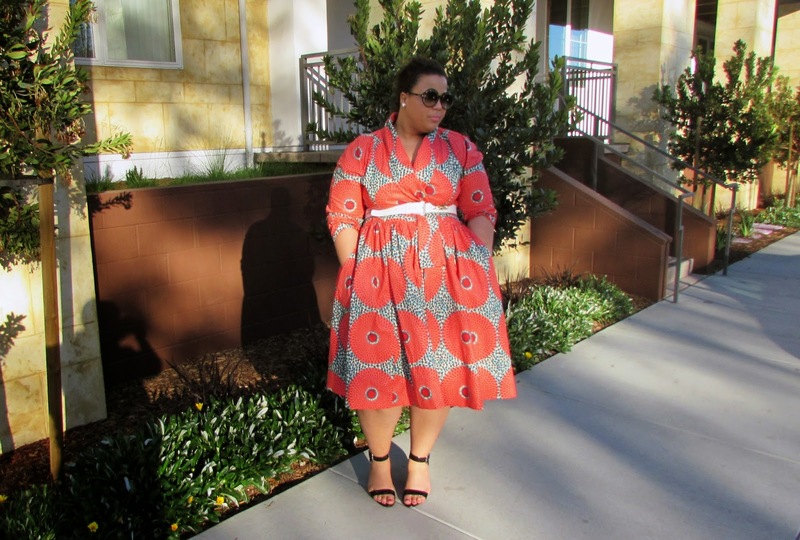 I've been looking for a really great ethnic print to make a full skirt. Thanks for the tips and sharing your amazing style! Thanks Janae and I hope you are doing good! I'm new to this fashion blogging thing but your style has inspired me to come out of my shell. 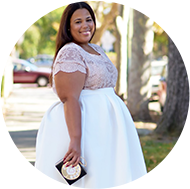 I didn't know there were so many plus sized clothing choices outside of LB, AS, and Torrid. My eyes are wide open and for the first time in a long time I'm excited for spring and summer!! I can't wait to emulate some of your looks!! I'm such a big fan of yours! I do a lot of high low shopping in my life and on this blog. My previous post had a $30 top with a $80 pair of pants. For me, I like quality garments with nice fabrics, cuts and style. This is actually had a really good price for the quality and seeing that I was able to request a customized length and arm width on this dress. I've already bought two other pieces and the fabric and style doesn't disappoint. If you are looking for more under 100 items then ck out places like Asos, H&M, and Forever21. It's pretty much a wrap so you will have a little room for error, but I would make sure to have your waist measurement and go by this size chart...that will help you get the right size. Also, the designer is pretty cool about customizing for you measurements. I asked for a longer skirt and larger arms for a good fit. You look lovely. Thank you for rocking "Ethnic print". I really like this dress!!! You styled it perfectly with the sunnies and the shoes!!! I have been wanting to buy a piece from them but I didn't know what I wanted to get. Your post with their pieces keep encouraging my purchase! Great post! I am such a fan of wax! I have been wearing it for so long! It's just part of my Fashion journey. Oh my gosh I just found your blog and I'm in love with your style! I usually never follow/like any fashion blogs but I adore yours, and I'd love to have your wardrobe. Actually, I borrowed one of your ootd-photos to my blog, I hope you don't mind (if you do, just let me know!). You're gorgeous!